In the wake of the horrific shootings at two New Zealand mosques, Christian media outlets and a UN-recognized human rights group have pointed to the lack of interest from the corporate media in the tragedy faced by black Christians in Nigeria at the hands of Fulani and Boko Haram Islamic jihadists. At least 120 people have been killed in reported Fulani terrorist attacks since February in the Kaduna state of Nigeria. The latest attack occurred on March 11, resulting in the deaths of 52 people and the destruction of more than 140 homes. In late January, Boko Haram jihadists killed at least 60 people in an attack on the northeast Nigerian town of Rann, Amnesty International said. Satellite images showed hundreds of structures were burned in the attack. Also going mainly unreported, in January two bombs tore through a Roman Catholic cathedral on the southern Philippines island of Jolo where Muslim militants are active, killing at least 20 people and wounding 111 others during a Sunday Mass. 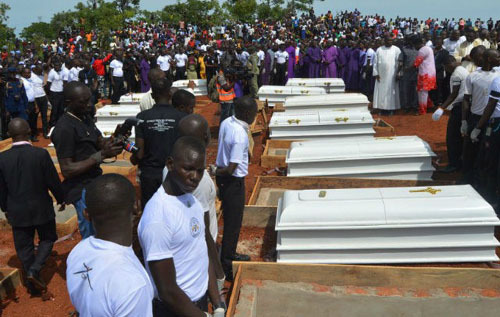 In 2018, thousands of Christians were killed by Fulani herdsmen, leaving some to say that genocide is occurring in the Middle Belt of Nigeria, The Christian Post reported. CSW, a United Nations-recognized NGO that advocates for persecuted Christians worldwide, reported that victims in the attack on March 11 included women and children. Survivors told CSW that the attackers were separated into three groups. One group shot and killed people, the second set fire to buildings, and a third ran after people fleeing the scene. CSW believes that the recent violence could have been incited by Kaduna Governor Nasir El-Rufai’s claims on the eve of Nigeria’s presidential elections that 66, mostly Fulani, people were killed in Kajuru. Rufai didn’t back down from the claim and later raised the death toll to 133 killed, according to CSW. Rufai also ordered the arrest of nine Adara elders and village chiefs. The March 11 attack followed an attack on March 10 in the Ungwan Barde village in Kajuru in which 17 people were killed and dozens of homes were burned, the Christian Post reported. In late February, an attack in Maro resulted in the deaths of at least 38 Christians. Homes and a church were burned. On Feb. 10, 10 people were killed in an attack in Ungwan Barde and six others were killed in isolated attacks the day before. Other states in the Middle Belt have been hit by Fulani violence. “The relentless death and destruction is a sad indictment of the continuing failure by both levels of government to fulfill the primary mandate of protecting all its citizens impartially,” Thomas said. Rann has been attacked four times by Boko Haram since March 2018, reports say. More than 27,000 people have been killed since the Boko Haram jihadist insurgency began in 2009, and 1.8 million people are still homeless and in need of humanitarian assistance, aid groups say. In the Philippines, Jolo island has long been troubled by the presence of Abu Sayyaf jihadists, who are blacklisted by the United States and the Philippines as a terrorist organization because of years of bombings, kidnappings and beheadings. No one immediately claimed responsibility for the January attack, The Associated Press reported. The attack came nearly a week after minority Muslims in the predominantly Roman Catholic nation endorsed a new autonomous region in the southern Philippines in hopes of ending nearly five decades of a separatist rebellion that has left 150,000 people dead. Although most of the Muslim areas approved the autonomy deal, voters in Sulu province, where Jolo is, rejected it. The province is home to a rival rebel faction that’s opposed to the deal as well as smaller militant cells that are not part of any peace process. Western governments “worry that small numbers of Islamic State-linked militants from the Middle East and Southeast Asia could forge an alliance with Filipino insurgents and turn the south into a breeding ground for extremists,” the AP report said. Meanwhile, media outlets in the U.S. attempted to link President Donald Trump to the terrorist attack in New Zealand. Other outlets pointed to comments they say Trump made after the Charlottesville, Virginia riots. CNN alleged that Trump called white supremacists at the riots “very fine people,” although it has been proven that quote was widely taken out of context by the corporate media. Yet CNN has reported that Trump was referring to neo-Nazis as “very fine people” in Charlottesville. “CNN is now using the Charlottesville lie to implicate Trump in the terror attacks against two mosques in New Zealand,” Breitbart noted. On March 15, CNN host Don Lemon played what Breitbart said was “a deceptively edited video clip” of Trump’s press conference from Trump Tower on August 15, 2017. Lemon left out that Trump had made clear he was not talking about the neo-Nazis: “I’m not talking about the neo-Nazis and the white nationalists, because they should be condemned totally,” the president said.